"Delivering an end result that you will be proud of"
The third element of our service is our garden maintenance programme, again carried out at small individual blocks and large residential estates around London. Our gardeners have a good basic knowledge of horticulture however specialists are present within the team should they be required. Not only is our team trained with the usual hand tools, we also offer the latest mechanized machinery which is well maintained and helps them provide excellent results on site. Our teams can take the most overgrown garden and deliver an end result that you will be proud of. 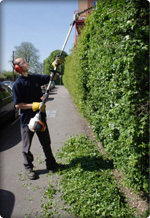 We not only provide gardening services to initially clear the area, we can then go on to maintain them to an extremely high standard. Due to unusual weather conditions (extreme dry or wet weather) lawns are under great pressure and as a result broad leaf weeds and moss growth rate increase rapidly. If this specialist treatment is required, we have a range of lawn treatments that can be added to your gardening services and specifications.